Gravina, 57, 41001 Sevilla, Spanien. 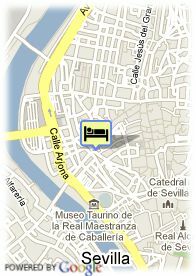 Hotel in the heart of Sevilla. 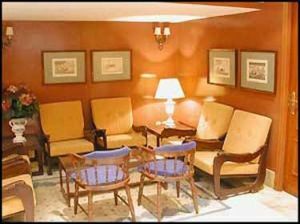 Hotel Reyes Catolicos is fully located in the centre of Sevilla city, just few minutes away from the traditional commercial district and from the main touristic city highlights, such as the Cathedral and its Giralda or the beautiful district of Santa Cruz. Its location is just a step away from the main public means of transport and the recreational supply of the city. All its rooms, recently refurnished, have the necessary equippment to be able to offer the maximum comfort to its guests, such as air conditioning, television with satellite dish or background music and others. The hotel also owns a car park. Its restaurant offers dishes based on the Mediterranean cooking, where the variety of the fresh products abound. Bezahltes öffentliche Parkplätze in der Nähe des Hotels (überdachte) (12.84 €), Reservierung erforderlich. Visa, Mastercard, American Express, JCB, Red 6000.